tips to help you start your journey to healthy long hair. 1- SHAMPOO-shampoo with a conditioning shampoo. Keep the hair nice & clean. 3- MINIMIZE THE USE OF HEAT APPLIANCES- Don't kill your hair with excessive use of the blow dryer. You should not over use flat irons & blow dryers. Even though they help you achieve beautiful styles, over use can cause the hair to dry out & start breakage. If the hair falls off your head, you want be able to style it anymore. 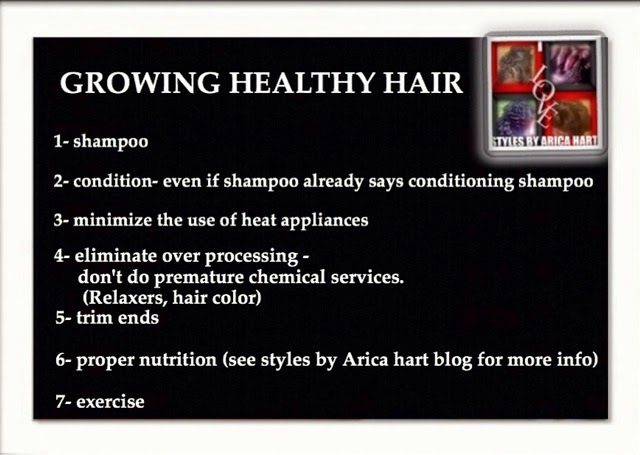 Therefore, start healthy hair habits before it's to late. 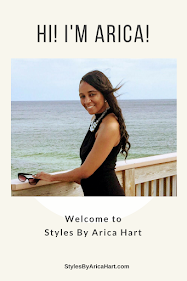 Try getting an Updo style; such as, a donut, bun, stuffed twist, sew-ins or etc. to give your hair a break from the heat appliances. 4-ELEMINATE OVER PROCESSING- try not to over process your hair by getting relaxers or permanent color before it's enough new growth. Premature chemical services are not healthy for the hair. Most people wait at least 6 weeks between relaxers. Their are some that can go longer with proper conditioning & moisturizing of the hair, but be careful & love your tresses. Make sure you wait at least 2 weeks before getting permanent color, if you just got a relaxer. Please don't over process those beautiful tresses. It's best to get a professional to do these chemical services, because they are trained to do it the proper way. 5- TRIM- you should occasionally get the ends trimmed to keep it from splitting up the hair shaft. Just as a plant needs pruning, your hair needs trimming to keep the hair growing healthy & long. There is a difference between trim & cut, but if you don't examine the ends & keep them neatly trimmed, eventually you may need a cut. Therefore, let's take preventive measures & keep the healthy hair maintained by trimming the split ends. 6- GET PROPER NUTRITION- We all need the proper nutrition for our bodies to function right. Our hair also needs the proper nutrition, as well. We need various nutrition for hair health; such as, protein, biotin, vitamin A, & other vitamins. 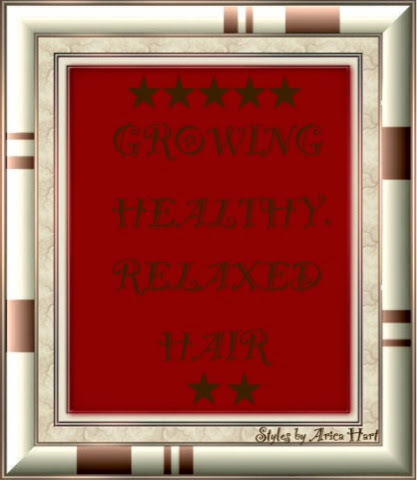 Hair growth is effected by proper intake of protien, biotin, & vitamin A. If our bodies have an inadequate amount, the hair may start to starve & deteriorate. You should try to get your nutrition from nutritious food sources. Drink plenty of water. Try eating fruits & vegetables every day. If you are still not getting enough, talk to your doctor about the best vitamin supplements for you. For farther details on this, see the related article links at the bottom of this article. 7- EXERCISE- We must keep our body in shape, not only for the body to look good, but for it to function correctly as well. If our bodies are sickly, the hair will become sickly as well. There are a various types of fitness routine; such as, yoga, cardio, and etc. You should reap the benefits of exercise by finding out a great workout routine for your healthcare needs from your doctor. So properly condition & moisturize the hair, eat right, exercise, get hair trimmed, minimize heat use & eliminate over processing. You can do it. You know the saying, "LONG HAIR, DONT CARE"! Wishing you a prosperous life & a blessed long hair journey. If you need my hair care services, feel free to let me know. Enjoy your day !!! WHAT HAIR TIPS DO YOU HAVE? IS IT HARD FOR YOU TO EAT HEALTHY? LET'S HAVE A FRIENDLY DISCUSSION ABOUT IT IN THE COMMENTS BELOW!! !